New Coat Painting Professionals (Painting Contractors) is an experienced installer of industrial epoxy and floor coatings. New Coat Painting Professionals (Painting Contractors) has the knowledge, experience and equipment to install quality floors in a cost effective manner. We install troweled, self levelling and broadcast seeded floor systems. Environment - Cracked floors and trenches may allow hazardous chemicals used in your facility to seep into the ground below. Not only is this environmentally unsound, but it may also violate EPA regulations. New Coat Painting Professionals (Painting Contractors) can repair and coat your concrete so that chemicals neither seep through, nor damage your concrete. 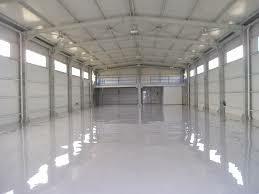 Cleanliness - In many warehouses, quality control depends on strict standards of cleanliness. Concrete dust can make meeting these standards almost impossible. New Coat Painting Professionals (Painting Contractors) can repair or replace your existing flooring, then coat it to prevent concrete dust and optimize production, making clean up easier in any facility. Aesthetics - Let's face it - stained, cracked concrete floors just do not look good, especially if this is an area your customers can see. But, even if it isn't, the appearance of your facility is to your employees a reflection on how you view your business. New Coat Painting Professionals (Painting Contractors) promises an attractive result - clean, level floors, perhaps painted and epoxy coated for an even more polished look. You, your customers, and your employees will be amazed at the difference! Please contact us if you would like to request additional information, clarification, or an estimate regarding this service or any of the other services that New Coat Painting Professionals (Painting Contractors) offers.